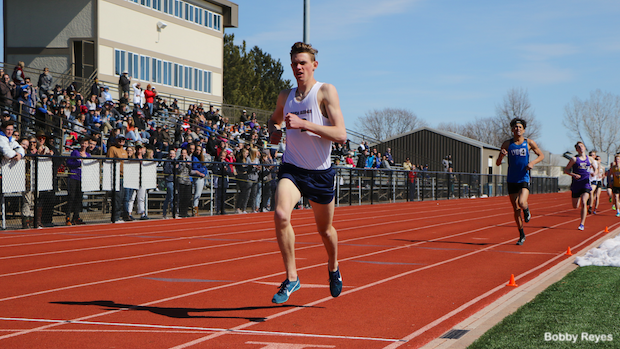 Announcer Mark Roberts read the clock off like test scores as Connor Ohlson and Colton Jonjak-Plahn cruised by the finish line for one more lap of the 800. Ohlson ran on in a trance, his face blank like a sheet of paper with no words. He pumped his arms in precision with the light taps of spike to bright orange track in a mechanical rhythm that oozed effortless speed. Behind him, Jonkak-Plahn squinted hard beneath a black Nike headband that held his thick curls back. He took long, loose strides that hinted of another gear. Between the slits of his eyes he looked just beyond Ohlson's shoulder, onward to clear pastures, the lead. But with 300 meters to go, it wasn't time. Down the backstretch the volume of pain dialed up along with the anxiety in the air. Ohlson, who was hitting the track for the first time since finishing 10th at Nike Cross Nationals, remained the trailblazer while Jonkak-Plahn stalked his prey. It was clear that they both could hear the tiny whisper in their minds, the one when you're wanting to scratch that competitive itch and surge hard, but the voice says: Not yet. Jonkak-Plahn waited, and waited, and waited to strike, while Ohlson was keeping things simple: stay in front. For the front runner racing is simple: set a hard pace and dare anyone to run with you, with the drawback being the fact that you're running through your gas tank faster than anyone else since you're leading, while the chaser's dilemma is slightly more complex: chase the hard pace and potentially forfeit my kick, or let the front runner get away and potentially run out of real estate once I start kicking. It's a decision made time and time again within the world of distance running when a strength runner goes head to head with a kicker, and Saturday afternoon it was clear that Ohlson was attempting to simplify the race, while Jonkak-Plahn was utilizing a tactic that earned him a fourth-place finish at last year's 2A state final in this very event. With 160 meters to go the arms were pumping and knees driving hard. And then that tiny little whisper, the one that you can hear through even the loudest of screams returned. Jonkak-Plahn attacked and for a brief moment it appeared that he may have timed this one perfect, as Ohlson stalled. Jonkak-Plahn pumped hard around the final corner and let his giant stride eat up precious amounts of track, but Ohlson wasn't done, not yet. 100 meters separated them from easy breathing, but there was still work to be done. Ohlson regrouped and stepped outside to Lane 2 - The Lane Of High Hopes - and responded in kind. The Dakota Ridge junior took the Lyons senior to task down the straightaway. Ohlson powered up and away on his own personal highway in Lane 2. First it was an inch of a lead, then a foot, then three, then 10, then it was over. Ohlson didn't relinquish the pace until safely beyond the finish line, crossing with a hint of fatigue across his face in a meet record of 2:01.45. The time is currently No. 3 in Colorado, and No. 1 in 5A. Behind him, Jonkak-Plahn never threw in the towel, he was simply out-dueled on this day. The Lyons senior crossed in second, running 2:03.33. For his efforts he nabbed the No. 10 time in Colorado, and No. 1 in 2A. While Ohlson and Jonkak-Plahn injected warmth into every spectator by pumping their blood with Race-Anxiety, their race was just one of many competitions Saturday at the Coyote Warrior Invitational that solidified the excitement that Track Is indeed, Back.